I'm going to try something new, here. Instead of just going down the list of messages from (roughly) top to bottom, I will try to talk about each turn in terms of myself and interactions with my opponents. If this format flops then hopefully you will let me know. Also if I should make my PG icons smaller (like maybe half or even quarter size) then throw that out for me as well. It would be easy enough to resize them. 12 more blood slaves from blood hunting, a new magic site (a Mineral Cave in Walden that provides 1 earth gem per turn) some unrest from shark attacks, a random "Witch Hut" event (pretty common, you bank some gems and some of your troops get cursed, but I guess many times those troops are PD so the curse has no effect). I'm still recruiting Witch Kings and Enchantresses but by this time I've stopped recruiting troops altogether. buildscharacter sent me a hammer and I sent him stuff. We have a lot of trades around this time and I can't review sent messages. My scouts and regular communication with buildscharacter are keeping me pretty well informed on his war with Lanka. At this point I'm pretty sure that Feinne has no idea that I've just set orders to attack him. In fact he probably won't care that much either, because conveniently this is the first turn that Lilli's Mictlan started attacking him. The timing could not have worked out better for me. I'm able to honor my agreement with Irony.or.Death's Pangaea by attacking, but I'm unlikely to face any real resistance because Lilli is the obvious threat. Sauromatia is kind of a weird nation. 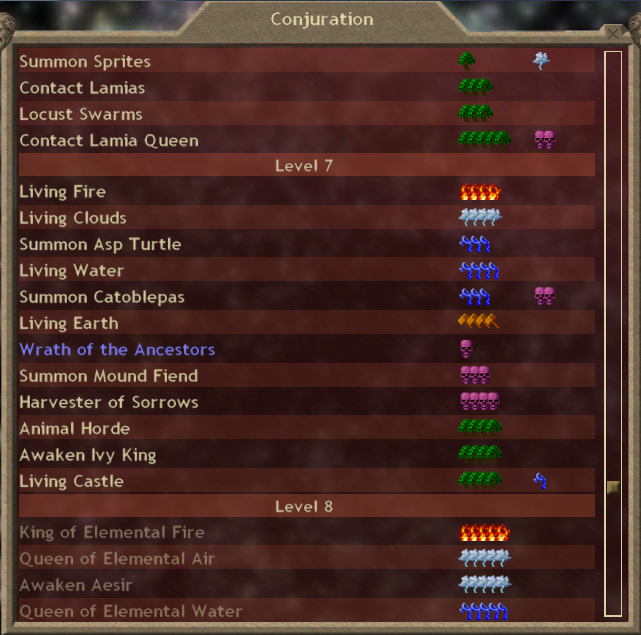 It has all kinds of good stuff on its own, plus good heroes that pull from the lore of Fomoria (and Tir na n'Og) and Arcoscephale, plus a couple of national spells that are normally T'ien Ch'i only. The blue one here is the second of those (the first I think we've talked about already, and is just a smaller version of this). Wrath of the Ancestors is a battlefield summon. For 1 death gem you get 18 + 2/D Ancestral Spirits. 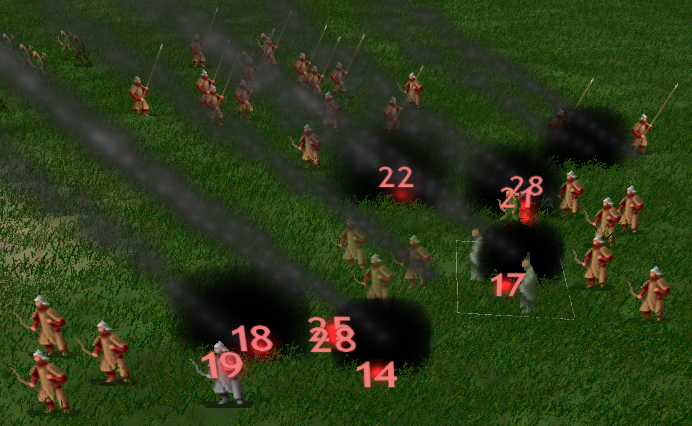 They have 1 hit point but they are size 1 and ethereal, and they have only one attack but it happens to be a melee paralyze. I have lots of mages who can cast this spell (Spirit Guides are D1, they would get 20 of these things at a minimal investment; Enaries are D2, they'd get 22 of these per cast; Witch Kings are usually D3 or D4, and dumping 26 of these is a great way to supplement Raise Skeletons or to provide cover for Shadow Blast spams or just to help bring down lone or paired thugs (usually a true SC will have enough MR to resist the paralysis). At this point I'm diverting my research to Thaumaturgy for a little bit. I am doing so because I have agreed to contribute to the coming war against Lilli's Mictlan by casting a certain global spell that my mages are well-equipped to handle. I will discuss that further when I actually cast it. In other news, 20 blood slaves and no new magic sites. To emphasize how quickly I am sacrificing slaves to prop up my dominion, and for that matter to get an idea of what I'm doing with my gems and gold and/or what I'm saving them up for, have a look at my summary window for this turn. Anyway there's not much else to say about anything except that fight with T'ien Ch'i. So, I'm sure you all remember how my army is laid out. Witch Kings in the back, archers staggered in two middle ranks, cavalry at the flanks and a handful of markata and ghouls in the front. The Enaries were slowing me down so I left them behind, which means that the markata and the ghouls are going to get slaughtered. What did T'ien Ch'i have? It looks like a mass of PD along with 16 17 Woodsmen, 2 Masters of the Way, and 2 Demons of Heavenly Rivers. Maybe a Master of the Dead, but then again that guy might be part of the PD. Oh, Shadow Blast. 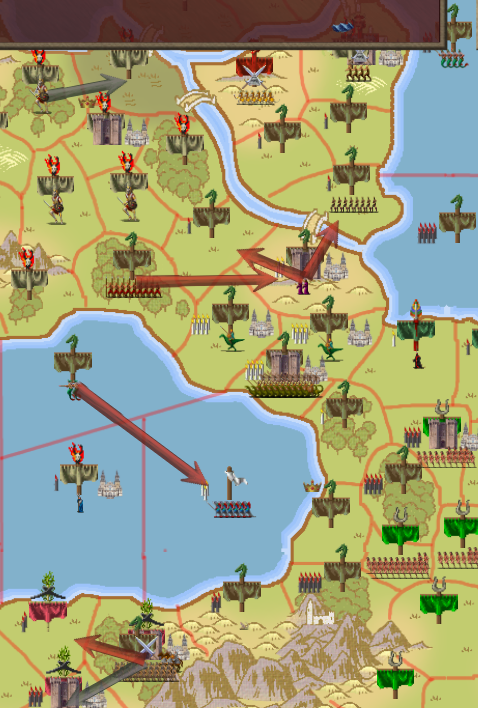 Between that (and another one that actually hit its targets) and the poisonous arrows of my archers and the initial charge of my cataphracts, the enemy army melts away. My casualties are a handful of archers that the enemy woodsmen managed to kill and some chaff. Maybe a cataphract who got poisoned? 10 units in all, no big deal. 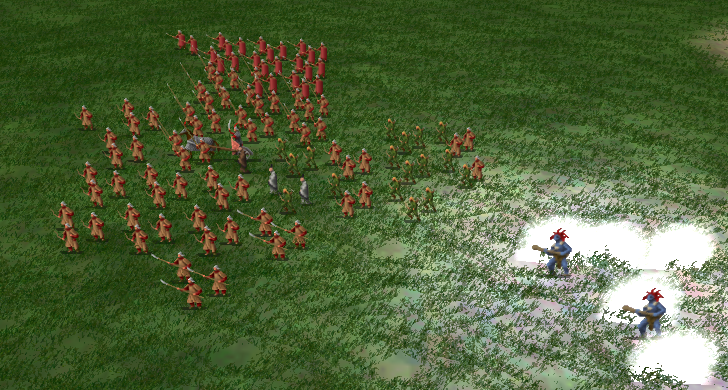 I killed 21, most of which were woodsmen (It looks like maybe he had maybe 9 8 footmen and I killed all of them). The bulk of my forces remain to besiege the fort while a small group of Witch Kings moves eastward into another T'ien Ch'i province (this one without a fort). I spoke with Lilli briefly about the speed of her expansion into two other nations, and which of Feinne's provinces she planned to take. She basically responded by telling me that if it is flying a pink flag this turn then there is nothing to stop her from attacking it next turn. Obviously she doesn't care about colliding with any of my forces (in particular) and she doesn't see me as anything approaching a threat (in general). At least Dexanth is still alive. If he were dead then I would stop getting zapped. EDIT: Added a map per buildscharacter's excellent suggestion. I have been neglecting maps for a while now. Next time I will write my post around maps a little bit, to help provide context. 4. Extract blood price from Arcoscephale (756 gold). EDIT 2: I also added flags next to the PG pictures per Smart Car's suggestion. They are so dramatically different in size when compared to the PG icons that I will swap out the PG icons with smaller versions on my side.